After months of will-they, won't-they rumours with the same amount of drama as Ross and Rachel's tumultuous relationship in seminal sit-com Friends, we finally have an answer as to whether Samsung will ditch the 3.5mm headphone port from its upcoming tenth-anniversary Galaxy S smartphones. And do not panic. The universal audio port will live to see another day, saving you the hassle of bulk-buying a load of USB-C-to-3.5mm dongles for all your older headphones, and leaving you unable to listen to music and charge your device at the same time – a frustration that can really make a longhaul flight drag. Samsung Note 10 could feature pop-up camera and "perfect screen"
There have been a slew of reports that Samsung would drop the 3.5mm headphone port from its next handset in favour of wireless audio over Bluetooth or cabled cans using the USB Type-C port. After all, the Seoul-based company already jettisoned the 3.5mm port in the Galaxy A8s – the first smartphone with its new Infinity-O style display, which is rumoured to be the headline feature of the new Galaxy S10 range. After years of mocking Apple over its decision to abandon the audio port in a series of high-profile advertisement campaigns, Samsung followed suit. 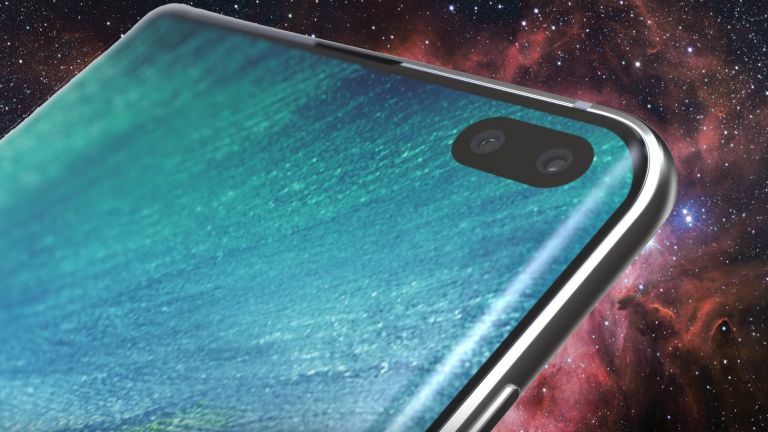 Reports from reliable sources suggested that prototype Galaxy S10 smartphones tested inside the company were also missing the connector that Samsung has so rigorously defended while rivals including Huawei Mate 20 Pro, OnePlus 6T, Razer Phone 2, and others, turned their back on the once-ubiquitous audio port. But it looks like these prototypes will never make it out of the R&D department, following confirmation that protective cases designed to the specifications outlined by Samsung and mailed to technology blog SamMobile ahead of the Galaxy S10 launch date, they all include a round cut-out ready for the 3.5mm headphone port. According to SamMobile, the inclusion of the headphone port will likely prevent Samsung from dramatically increasing the size of the battery inside its next-generation Galaxy S smartphones – one of the primary reasons rival manufacturers site for ditching the audio port to free-up space inside the device. Although the larger S10 Plus model may still find room to squeeze a larger battery, don't expect to see any significant battery life gains with these new models, it cautions. Samsung is still widely-rumoured to drop the 3.5mm headphone port from its upcoming Galaxy Note 10 handset, tipped to launch this August. As reliable as SamMobile has been in the past, it's always sensible to take these leaks with the prescribed pinch of salt. Nothing is confirmed until Samsung mobile chief DJ Koh takes to the stage and announces the next iteration of the Galaxy S line on February 20, 2019. As always, T3 will be in the crowd and will have all the latest as it breaks. Stay tuned.